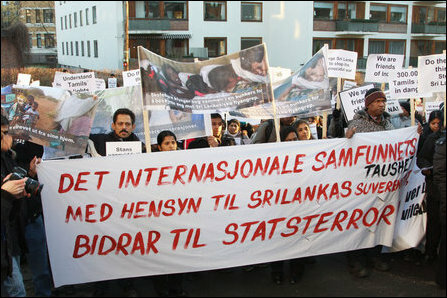 Around three hundred Norwegian Tamils gathered in front of the Indian Embassy in Oslo Wednesday between 2:00 p.m and 3:00 p.m in an attempt to draw the attention of the Indian state to stop the genocidal war waged on the Tamils in Vanni by the Government of Sri Lanka. 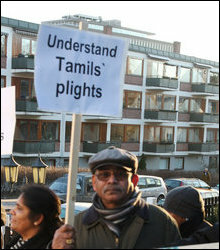 Norwegian Tamil Federation (NTF) which had arranged the demonstration presented a memorandum of its requests to Prime Minister Manmohan Singh by handing it over to the representative of the Indian Embassy in Oslo. 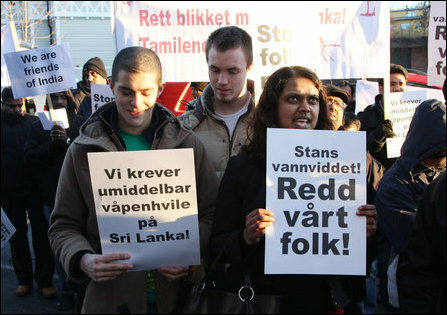 India to urge Sri Lanka to immediately stop its genocidal war on the Tamils in Vanni. The failure of the Indian government to act positively on the joint resolution passed by all political parties of Tamil Nadu has caused great grievance to the Tamils. India should take immediate action to stop the war by the Sri Lankan state and bring out a ceasefire without delay. 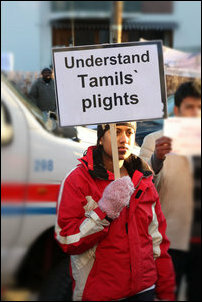 The demonstrators shouted the above requests in the form of slogans besides carrying placards and banners to draw attention to the genocide of Tamils unleashed by the government of Sri Lanka. "In spite of the Tamil Nadu Legislative Assembly passing a resolution unanimously seeking the intervention of Indian Government to bring about a Ceasefire in Sri Lanka and in spite of the Tamil Nadu Chief Minister Hon.Dr.M.Karunanithy meeting you in New Delhi along with an all party delegation and the Tamil Nadu Ministers and Members of Parliament meeting you in this regard, you have not taken any action to stop the war on the Tamil people," said the appeal handed over to the Indian Prime Minister through the High Commission in Oslo. "Mr.Pranab Mukerji, the Foreign Minister, has not gone to Sri Lanka as promised. However, soon after the terror bombings in Mumbai for which India openly alleges Pakistan's involvement, Indian, Bangladeshi, Pakistani, American, British, Maldivian and Japan Defense Advisors have jointly visited Vanni and met with the Vanni Sri Lankan Armed Forces High Command instead of meeting the IDPs and the suffering masses as an independent group to ameliorate their hardships," the appeal further noted.